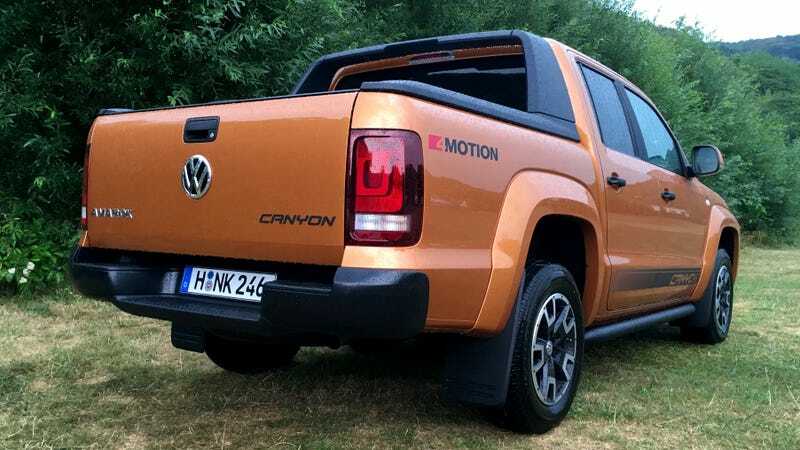 Let me get this out of the way right now: the Chicken Tax is bad and dumb for preventing us from getting good little trucks like the Volkswagen Amarok. It should die. I’m spending the week in an Amarok, camping out at the Nürburgring and flooring it on the Autobahn like a maniac. What would you like to know about a good little truck that we don’t get? So far, the Amarok is pretty good. It’s just big enough to feel massive on streets full of Volkswagen Golfs, Ford Fiestas and other small cars, but not so big as to feel unwieldy. It’s got Volkswagen’s 4Motion all-wheel-drive system, which traversed slick grass to our campsite with no problems. I’ve got a Comfortline Amarok Canyon for the next week that came with a neat rolling enclosure for the bed. My luggage was neither noticed nor bothered riding back there on the trip up from Stuttgart. Also, I can confirm that the hilarious carbon-fiber-print-trim seats are pretty comfortable. In an inexpensive sportscar, fake carbon fiber is a cheesy sin. In a truck with big “Canyon” decals down the side, faux carbon fiber print is just whimsical and silly. The big turbodiesel V6 up front just hauls and hauls. It’s comfortable sitting at 95 mph on the Autobahn, no prob. Why don’t we get this truck again? And why on earth do we have speed limits in our vast expanses of Nowhere Land out west? This is clearly the way to do long-haul roads, friends. Best of all, I no longer look at German Ford Rangers with longing and sadness. Instead, they are my nemesis, as I am sitting in a good small truck called the Amarok that we also don’t get. Can I move here? Then again, there’s always hope. Late last year, Volkswagen registered the name “Amarok” in the United States, and we are going to get that Ranger soon. But I’m not reviewing this for me. I’m here for you. So, what would you like to know about the Amarok in all its unobtanium TDI glory? Comment away!